It was six years in the making from concept to completion and well worth the effort. 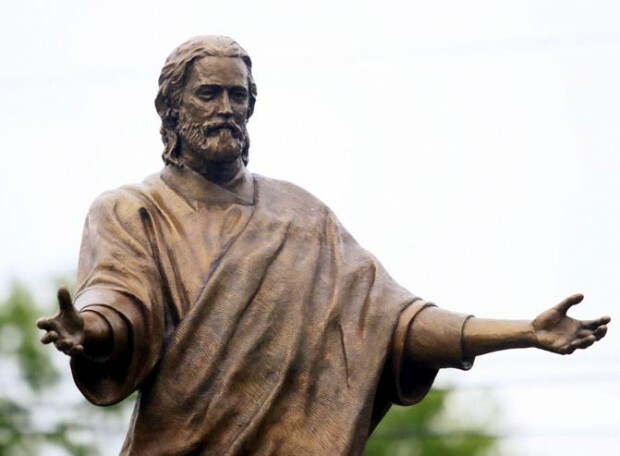 The heroic bronze statue of Christ titled “Welcoming Jesus” facing the highway is indeed a welcome addition to the entrance of the campus of Archbishop John Carroll High School in Radnor. 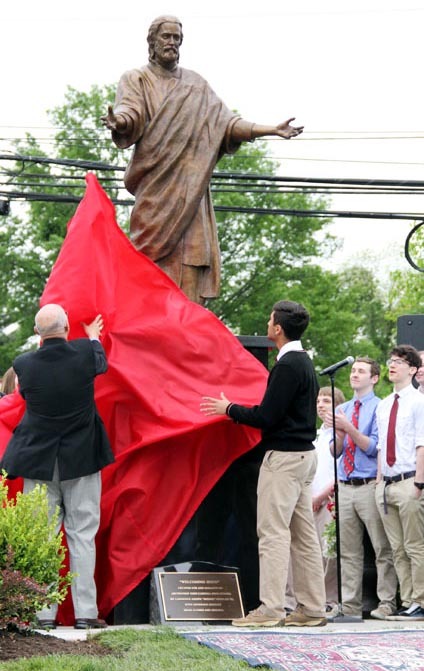 “Welcoming Jesus” was unveiled, blessed and dedicated May 21 by Auxiliary Bishop Michael Fitzgerald, who oversees Catholic education in the Archdiocese of Philadelphia, before a gathering of an estimated 2,000 students, faculty, archdiocesan Catholic education officials and alumni. The only person of importance missing was Doobie Nowlan, who died suddenly at age 48 in 2013 after his part in the project, the sculpted clay figure of the image from which a mold would be created and the statue would be cast, was essentially completed. He was represented at the unveiling by his widow, Heather Nowlan, who came down from Vermont for the ceremony. The genesis for “Welcoming Jesus” was a presentation by Doobie Nowlan at a career day assembly at Carroll. A daughter of Marita Coffey Finley, class of 1986, spoke about it at home and her mother, an ardent Carroll booster, called Nowlan that same night with the proposal that he create something meaningful for the high school. He readily agreed, and the alumni set to work to raise the necessary funds to have his work cast in bronze and do the necessary site preparation among other costs. 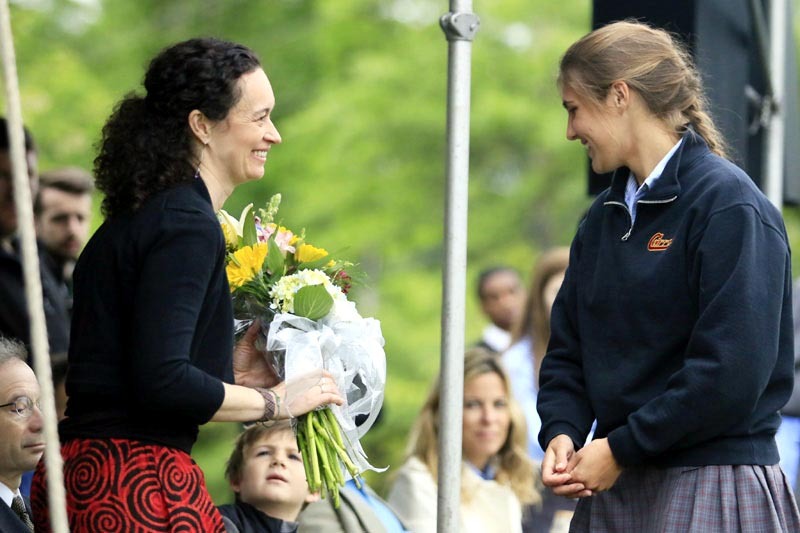 Other speakers at the ceremony included Bishop Fitzgerald; Thomas Phillips, Carroll’s campus minister; Francis Fox, class of ’77, school president; and archdiocesan Secretary for Catholic Education Christopher Mominey. Clearly the most powerful words were those given by Heather Nowlan. As his wife explained, Doobie’s Vermont studio was in an unused church that still retained its stained glass but was cleared of pews. At the time of his death “Welcoming Jesus” dominated the center of the building. Their little son and daughter, now in kindergarten and second grade, would also play in the studio. They adored using their dad’s tools and clay to fashion little works of their own. She recalled her husband counseling students to find their passion as they moved into the real world. PREVIOUS: $12 million award will help build senior housing in South Phila.